KGDF series silicon controlled electroplating rectifiers adopt 6-pulse or 12-pulse thyristor rectifier. These silicon controlled rectifier are mainly used as rectifier power supplies for surface electroplating of all kinds of metal and nonmetal, such as electroplating zinc, nickel, chrome, titanium, etc. 1. Local control and remote control operation modes are available for KGDF series silicon controlled electroplating rectifiers. 2. These series silicon controlled rectifiers adopt constant current or constant voltage output control modes. 3. Soft start working time can be adjusted between 0 to 200 s.
4. Constant current and constant voltage control accuracy is ≤ ±1%. 5. Our silicon controlled electroplating rectifiers use thyristor phase-shifting for voltage regulation and rectification. 6. The output ripple coefficient of 6-pulse silicon controlled rectifier is ≤5% while that of 12-pulse rectifier is ≤3%. 7. SCR trigger controller adopts DSP microcomputer digital trigger control. The degree of asymmetry of trigger pulse is ≤0.1° and the pulse phase-shifting resolution is ≤1μs. 8. KGDF series silicon controlled electroplating rectifiers have many protection functions: lack of phase (default phase), overvoltage, undervoltage, quick fuse or fuse alarm protection of AC power supply, output overcurrent and current-limiting protection, output short circuit and instantaneous overload protection, overheating protection of thyristor components, rectification transformer and copper bus bar, overheating and high pressure protection of wind machine, low block trigger pulse protection, etc. 9. We can configure this silicon controlled rectifier with CAN BUS, PROFIBUS, ETHERNET, RS485 and RS232 fiber communication to realize remote control or monitoring. 10. 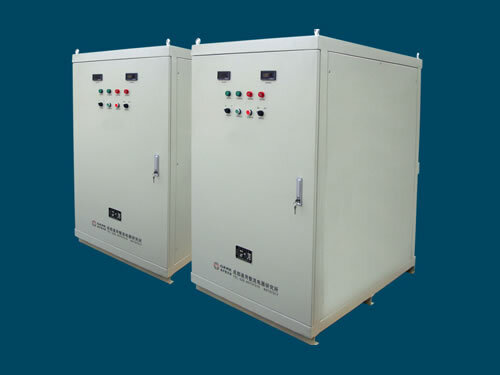 Rectification transformer of KGDF silicon controlled electroplating rectifiers adopts three-core five-column structure. The iron core uses good oriented silicon steel sheet and the transformer coil is winded by full copper wires. The no-load loss of this silicon controlled rectifier is less than 2%, saving 8% to 10% electricity than common three-phase three column rectification transformers. 11. Remote control operation box can be configured according to customer’s situation on site. 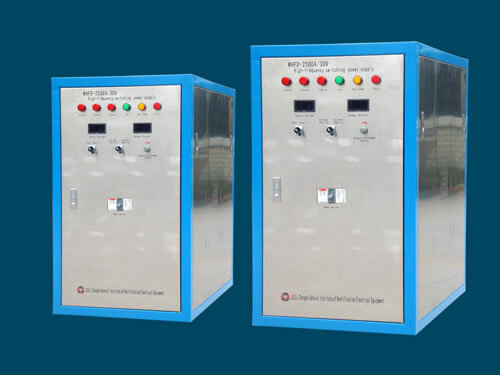 The host and remote control cabinet are placed separately, making on-site operation more convenient and obviously increasing anti-corrosion protection of host. Chengdu General Rectifier Research Institute is a professional manufacturer and supplier of silicon controlled electroplating rectifiers in China. In addition to this silicon controlled rectifier, we also produce silicon controlled reversing plating rectifier and high frequency inverter soft switch electroplating rectifier. Our products have been exported to USA, Germany, Australia, Singapore, India, Brazil, Iran, Vietnam, Kazakhstan and Malaysia, etc.